Welcome to Classic Aircraft Displays! It´s our mission and passion to provide iconic historical aircraft for air displays or private gatherings as well as media consulting and photo- and film work. Founded in 2012 by Stephen Stead and Christian Bramkamp, Classic Aircraft Displays has grown successfully in terms of members and capabilities. Our core fleet owned and operated by Stephen consists of the British Supermarine Spitfire Mk.XVIe TE184, Russian Yakovlev Yak-3 and German Bücker BU133C Jungmeister. In addition, through close links and friendships to our network of close associates we are able to provide a wide variaty of historical airplanes in the range of light biplanes to heavy fighters. 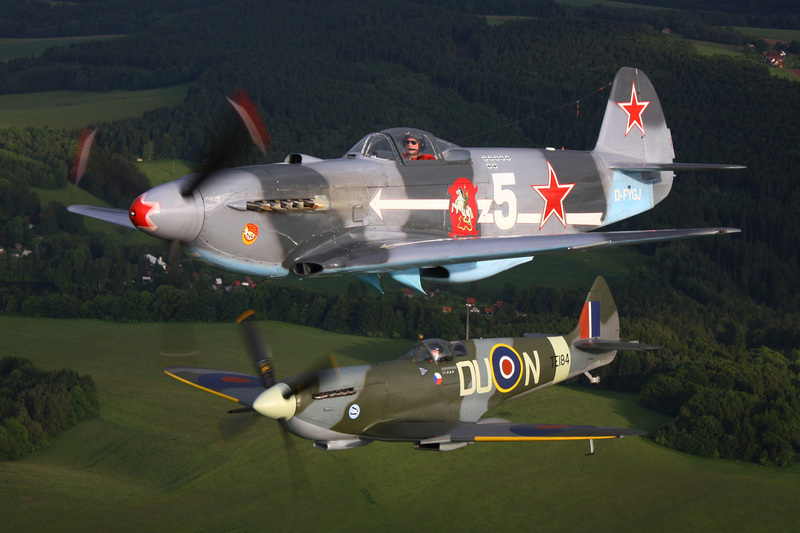 During the summer we are based in central Europe with good access to most airshow venues. Our pilots are highly experienced with all necessary and qualifications and holders of display authorisations for the type of aircraft they fly. In 2014 we ve created our own "Squadron-Badge", containing the motto "Per lentem ad Caleum", meaning through the lens to the skies. This refers to our core competance in photography services that we are able to provide. Within the last year´s, several successful photoflight events with a wide variety of participating aircraft have been run by Christian. Several interesting airplanes like P-51D Mustang, P-40N Warhawk, Lockheed Electra or Hawker Hunter joined our team to satisfaction of the participating photographers from all over Europe. We wish you all best for a safe and exciting flying season and hope you will enjoy our website as it develops.